John Adams once said, “There is nothing which I dread so much as a division of the republic into two great parties, each arranged under its leader, and concerting measures in opposition to each other. This, in my humble apprehension, is to be dreaded as the greatest political evil under our Constitution.” He tried to warn us about what pineapple on pizza would do to us, but did we listen? No. This simple pizza topping has been a source of contention among family, friends, and society and forced brother against brother for far too long. With such contention among loved ones, how do you attempt to choose pizza specials for dinner? Today, we will attempt to bring two sides together. Understanding our past is key to discovering how we have arrived at this point and how we can move forward. In 1962, Hawaiian pizza claims to have been invented by chef Sam Panopoulos in a restaurant outside of Toronto, Canada and thus, the great debate was born along with it. The inspiration for this dish came from Sam’s experience cooking Chinese dishes which often use the combination of savory and sweet flavors. At this time, bacon, ham, and pineapple were all very not popular toppings for pizza, however, soon they spread across the world. That said, not everyone is a fan of the combination. One side claims pineapple on pizza is an abomination, while the other claims it is the greatest topping there is. Do you think pineapple belongs on pizza yes or no? Pineapple on pizza is trash. If I want Pineapple on my pizza, I’ll by God have it. Obviously, there are some heated emotions. But maybe understanding just why these emotions exist can help us better understand. 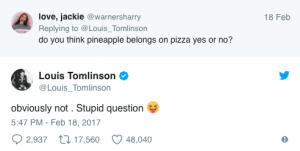 Why do people like pineapple on pizza? Pineapple is sweet and as a pizza topping, it is often paired with something salty such as ham or bacon. Savory and sweet is a long-standing favorite of many cultures. Pineapple on pizza can offer a change to the old familiar taste of pizza (not that there’s anything wrong with that delicious taste!). Why do people dislike pineapple on pizza? It’s just simply a step to far. Veggies only on pizza. No fruit. People like their pizza spicy, not sweet. Perhaps Pineapple insulted their family. Whatever the case may be, whatever the argument is, the answer is always pizza. Pizza brings cultures and families together and here at Romeo’s, it pains us to see a debate such as this tearing people apart. Join us in helping to mend our torn world, and look past the fault of others (whether you like pineapple or not). Go ahead and order a pizza with pineapple on one side. Pizza comes in many shapes, forms, and sizes all created through ingenuity, the human spirit and our desire to expand the world around us. Pineapple will not be the last pizza debate we encounter, but we can learn acceptance and understanding of our fellow pizza eaters and apply the lessons we’ve learned to the next one. This 2018, let us put down our torches and pitchforks, and pick up a pizza. At Romeo’s, we are always seeking to craft new and unique pizzas so of course, we are not outwardly against the use of pineapple, but we also hope that those of you who are against it can forgive us and find something you do love on our menu. Order Romeo’s from a pizza shop near you today and forgive those around you and all of their pizza flaws.